Lying nine miles off the coast of New Hampshire is a group of nine rocky islets known as the Isles of Shoals. Five of the islands lie in Maine waters while the other four are part of New Hampshire. In May 1820 Congress appropriated $5,000 to erect a lighthouse on the southern most of the islands, White Island. A forty foot tower and a Keepers residence both built of rubblestone were erected and the lighthouse went into service January 1821. The tower had an iron lantern with 15 lamps arranged on a triangular chandelier. Originally the lights flashed in a pattern of red, white and blue but the blue light was discontinued as mariners had difficulty seeing it. 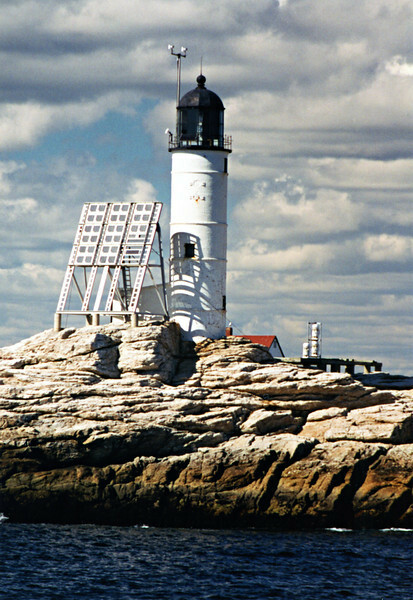 The lantern and lighting system were replaced in 1841.